Crossing of Bristol Channel from Ilfracombe to Swansea. 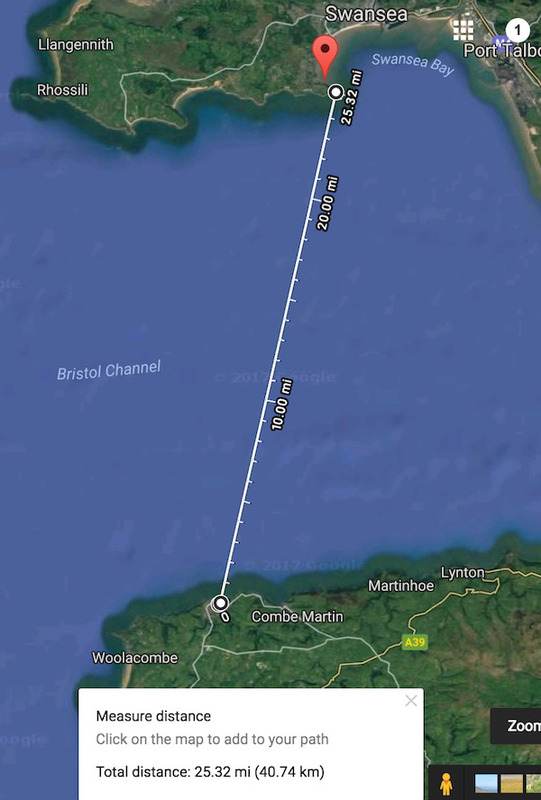 First female and fastest crossing of Bristol Channel from Ilfracombe. 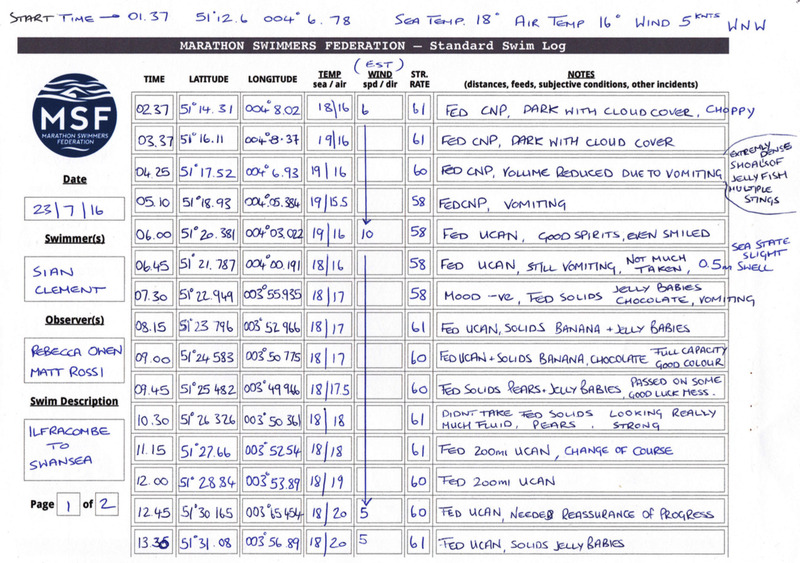 In 2009, Gethin Jones swam from Ilfracombe to Caswell Bay, Swansea in 21 hours, 39 minutes. Start: July 23, 2016, 01:37. Finish: July 23, 2016, 15:38. 30-minute trackpoint interval. Download raw data (CSV). For those of you who don’t know me I am a GP in Fforestfach Medical Centre in Swansea, I am also a GP Appraiser. I decided at the end of last year that now was the time to actually achieve a dream that I have been contemplating for the last 7 years, that is to become the first female (and second person) to swim the Bristol Channel from Ilfracombe. Many others have swum the Bristol Channel but at a point where it is much narrower than where I did. 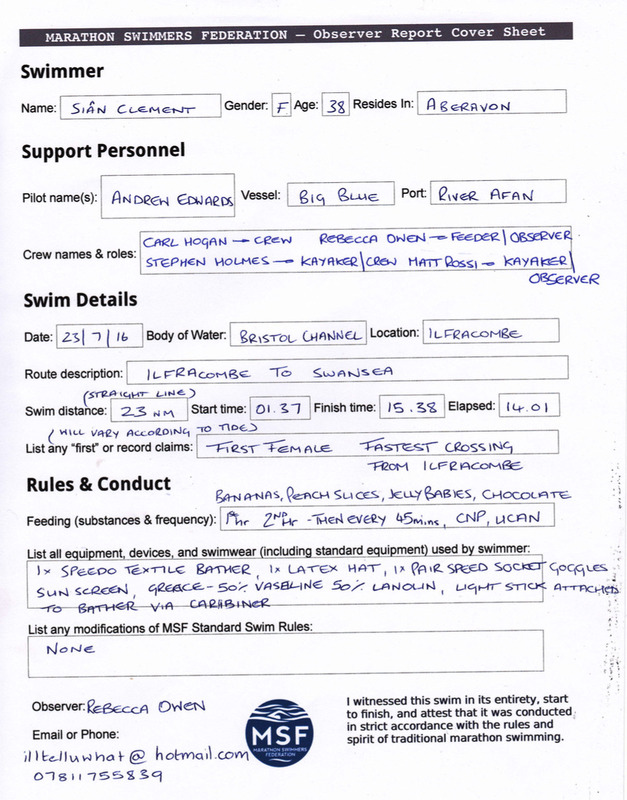 The basic rule is that throughout the swim you cannot touch anybody or anything (with the exception of a feeding pole used to provide food). I completed it successfully in a time of 14 hours and 1 minute. I learnt a lot from the swim, most of which can be translated into my work life. 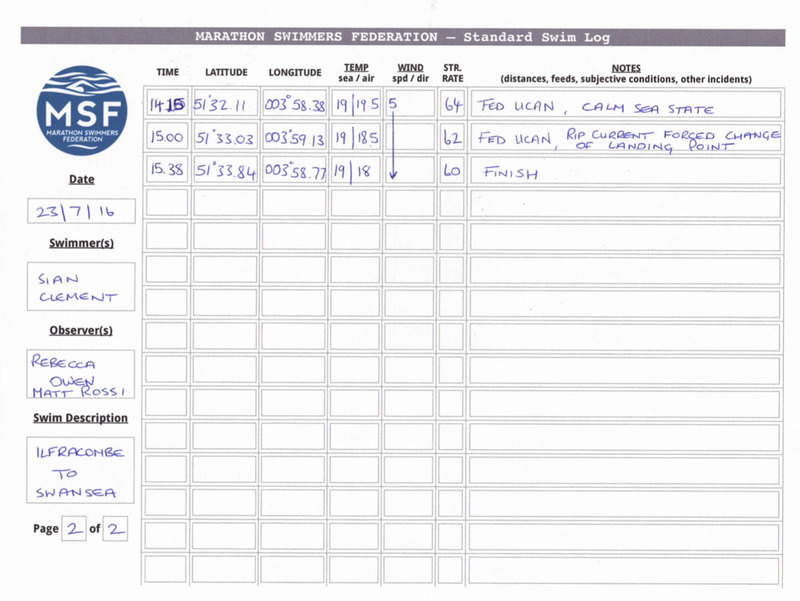 Firstly, the preparation in terms of the logistics was an emotional rollercoaster which I was not prepared for, the training itself was much easier than the planning. When on such a rollercoaster small setbacks can be enough to make you want to quit, it is important during those times to have supportive friends and family who can keep you positive and provide a more balanced view. Secondly, your body is an amazing thing and can cope with huge stress, especially if you have trained it, but your mind is more powerful and is what will determine whether you are successful or not. Approximately 4 hours into my swim I was vomiting more or less continuously and swimming through shoals of jellyfish who were stinging me everywhere, I was also struggling to spot my support team due to low light conditions. I really did not think that I could complete the swim. I was in a bad place mentally. Then one of my supporters said something very positive to me during a feed stop and my thinking changed completely all of a sudden I felt good and my swimming felt stronger. It’s taught me how important being strong mentally is and I realise that especially for our patients with chronic diseases their emotional wellbeing and mental strength is probably more important for their experience of their illness than their physical state, yet it is their physical state that we focus on. Any donations are much appreciated. I could not have done this swim without the support of my family, friends and support team, I am so grateful for everything they have done to help and can’t thank them enough.